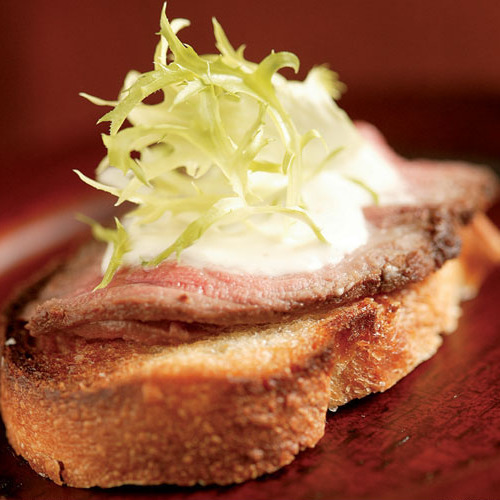 Dry-aged beef has a remarkable depth of flavor, but it can be expensive and hard to come by. The good news is that if you have a refrigerator, you can dry-age beef at home. If you’ve had the good fortune of tasting dry-aged beef, then you know that it has a remarkable depth of flavor. Unfortunately for those of us who don’t have a high-end butcher or serious steakhouse nearby, dry-aged beef can be hard to come by without involving FedEx and a big credit card charge. But the good news is that if you have a refrigerator, you can dry-age beef at home. All fresh beef is aged for at least few days and up to several weeks to allow enzymes naturally present in the meat to break down the muscle tissue, resulting in improved texture and flavor. 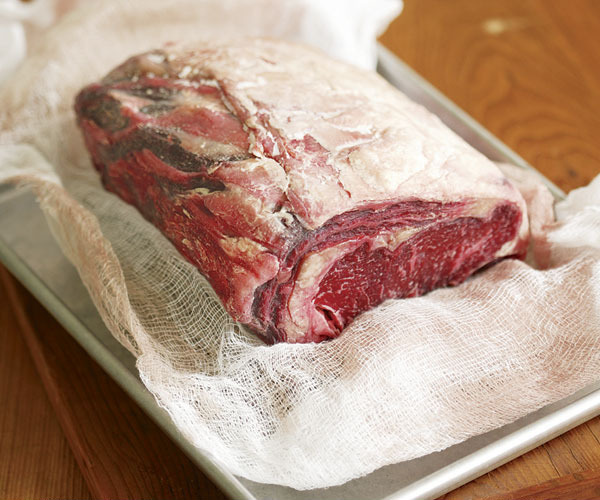 These days, most beef is aged in plastic shrink-wrap—a process known as wet-aging. Dry-aged beef, on the other hand, is exposed to air so dehydration can further concentrate the meat’s flavor. It’s a more expensive process than wet-aging, however, because the meat loses weight from dehydration, and it also must be trimmed of its completely dried exterior. We dry-aged a previously wet-aged boneless beef rib roast from our local market in one of our test kitchen refrigerators for three days. We had another rib roast from the same steer which we left in its plastic wrap to continue aging for the same amount of time. After roasting, we tasted them side by side. The dry-aged roast was more succulent and had a mellower yet beefier flavor than the wet-aged roast, which tasted watery by comparison. Next, we dry-aged another roast for seven days, and we were blown away by the flavor. Despite the loss of 20% of its original weight, we’re convinced that for a truly special occasion, like a Christmas or New Year’s dinner, dry-aged beef is worth the time and expense. Seven days later (and six ounces lighter). 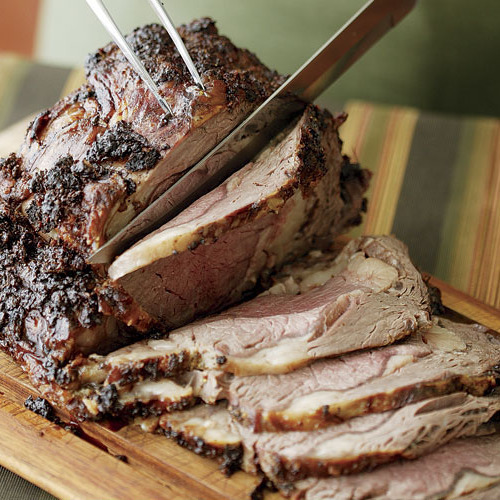 One: Buy a prime or choice boneless beef rib or loin roast from the best meat source in your area. Two: Unwrap the beef, rinse it well, and pat it dry with paper towels. Do not trim. 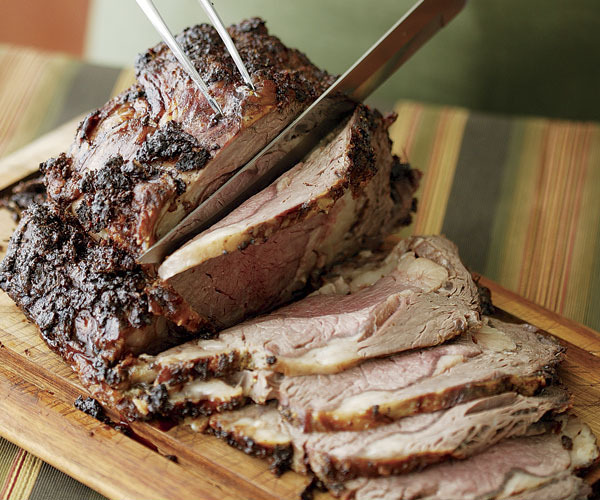 Wrap the roast loosely in a triple layer of cheesecloth and set it on a rack over a rimmed baking sheet or other tray. Three: Refrigerate for three to seven days; the longer the beef ages, the tastier it gets. After the first day, carefully unwrap and then rewrap with the same cheesecloth to keep the cloth fibers from sticking to the meat. Four: When ready to roast, unwrap the meat and, with a sharp knife, shave off and discard the hard, dried outer layer of the meat. Shave away any dried areas of fat, too, but leave behind as much of the good fat as possible. Roast whole or cut into steaks. Home refrigerators aren’t as consistent or as cold as commercial meat lockers. Before aging meat at home, get a refrigerator thermometer and be sure your fridge is set below 40°F. 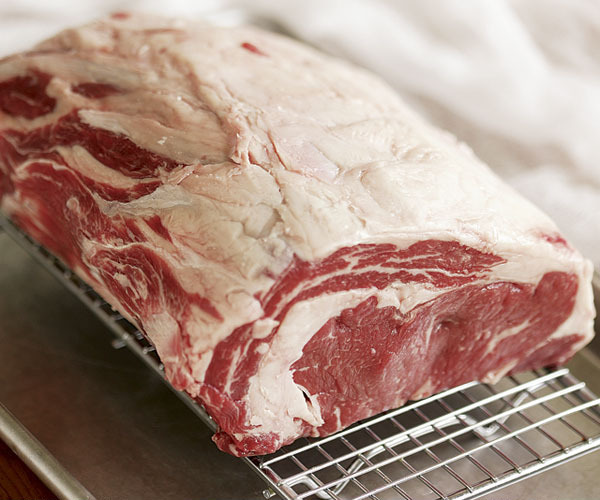 Cook or freeze the meat within seven days of beginning the dry-aging process.